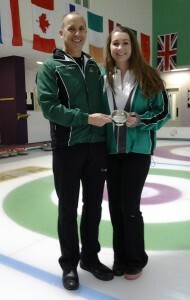 Congratulations to Neil and Alison Fyfe who won the Irish Mixed Doubles Championships at Dumfries Ice Bowl at the weekend. Two shots down going into the last of the regulation eight ends, the father and daughter duo held their nerve to score a three to beat the defending champs, John Furey and Louise Kerr 9-8. In the deciding end, Furey and Kerr, lying second shot, decided to guard up, but when Louise’s last shot drew too far, Neil pounced and blasted the shot away. Now lying two shots against, both open, John elected to hit the stone at 11 o’ clock at the top of the eight foot, hoping to roll over behind cover. But playing an inside out shot for the first time his shot drew more than expected and clipped a guard. That left Alison to draw for the three to win and she played it perfectly. The final was very exciting for the two spectators in the gallery as was the semi final earlier in the day! 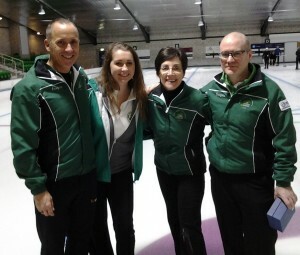 John and Louise were outplayed for six ends by Alan Mitchell and Ailsa Anderson but scored a four in the seventh and stole one in the last end to make it peels. In the extra end, John played a topper with his last stone to tap back the opposition stone on the button, pushing it through far enough to lie two. Alan then tried to follow that but was too heavy. His stone clipped the side of the first shot, jamming it onto the stone John had just moved off the button to leave Furey / Kerr lying two. 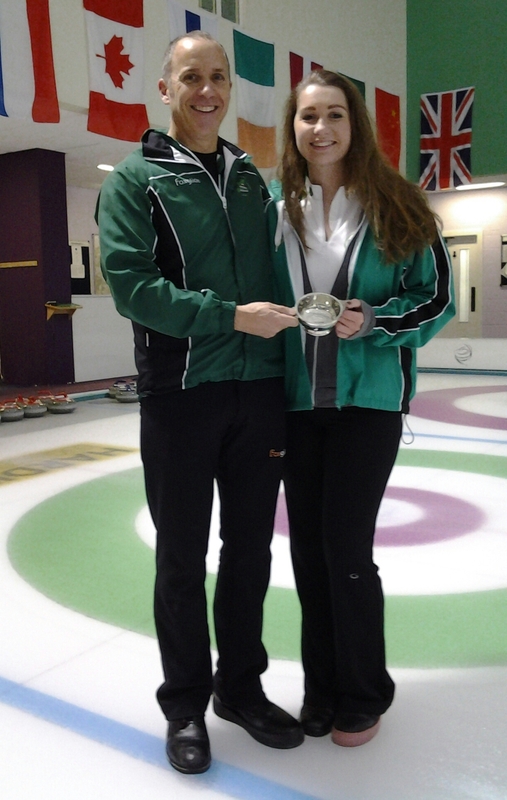 The round-robin games, all played on the Saturday, worked out well for the dad and daughter combo from Portpatrick. They cuffed Furey / Kerr before squeaking past Mitchell / Anderson. That gave them a lie in on the Sunday while the rest dragged themselves into the ice bowl at the crack of dawn. 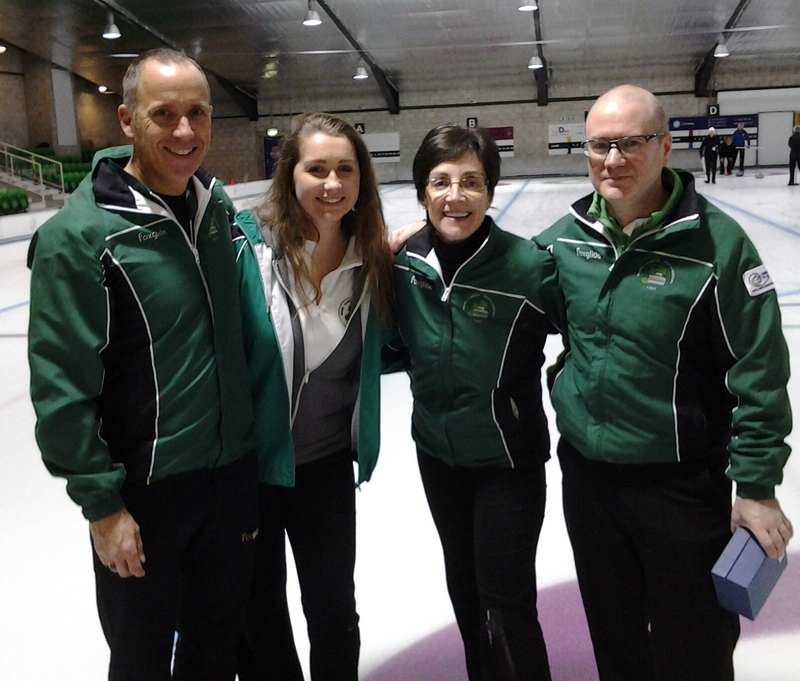 Thanks go to John Burns for acting as umpire throughout the weekend and keeping everyone right, and to the timers, English curler Alistair Fyfe (definitely a relation) who timed the first game on the Saturday morning and Ian Dyer from Dumfries who manned the clocks on the Sunday. The new ‘thinking time’ certainly concentrated the mind and stopped players looking at 25 options before nominating a shot. The ice was excellent and the fact the ECA were holding their senior playdowns as well gave the players company both on and off the ice. A most enjoyable weekend of mixed doubles once again. Roll on next year!